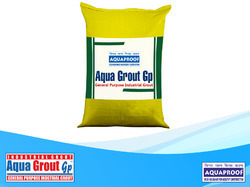 Providing you the best range of aqua grout gp with effective & timely delivery. Aqua Grout Gp is a blend of high quality Ordinary Portland Cement, selected grade of silica sand and fillers, various additives and fluidifiers, designed to produce a high grade grout free from segregation. Non- ferrous and hence will not corrode bolts and base plates. Free of Chlorides, Sulphates, Phosphates and Nitrates. One 50 kg. sack of Aqua Grout GP yields 22.5 liters of grout. In less demanding applications, the yield can be increased by mixing clean and sound 10 mm and down aggregates in the proportion of 1:1 by volume with reduced flow. Available in various strength level to unit everybody’s need. Looking for Industrial Grouts ?